de la Rosa P, Barnett J, Schafer R. 2003. Loss of pre-B and IgM(+) B cells in the bone marrow after exposure to a mixture of herbicides. J Toxicol Environ Health A. 66(24): 2299-313.
de la Rosa P, Barnett JB, Schafer R. 2005. Characterization of thymic atrophy and the mechanism of thymocyte depletion after in vivo exposure to a mixture of herbicides. J Toxicol Environ Health A. 68(2): 81-98. Faustini A, Settimi L, Pacifici R, Fano V, Zuccaro P, Forastiere F. 1996. 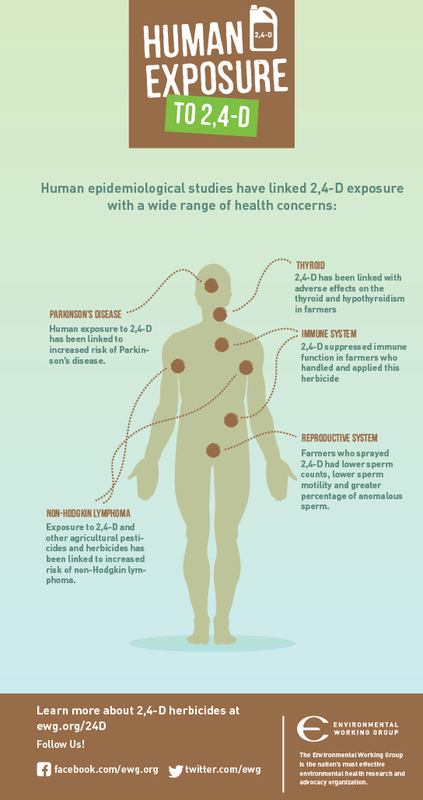 Immunological changes among farmers exposed to phenoxy herbicides: preliminary observations. Occup Environ Med. 53(9): 583-5. Goldner WS, Sandler DP, Yu F, Shostrom V, Hoppin JA, Kamel F, LeVan TD. 2013. Hypothyroidism and pesticide use among male private pesticide applicators in the agricultural health study. J Occup Environ Med. 55(10): 1171-8. Miligi L, Costantini AS, Veraldi A, Benvenuti A; WILL, Vineis P. Cancer and pesticides: an overview and some results of the Italian multicenter case-control study on hematolymphopoietic malignancies. Ann N Y Acad Sci 1076:366-77, 2006. Schinasi L, Leon M; 2014. Non-Hodgkin Lymphoma and Occupational Exposure to Agricultural Pesticide Chemical Groups and Active Ingredients: A Systematic Review and Meta-Analysis. Int J Environ Res Public Health. 11(4): 4449-4527. Tanner C, Ross G, Jewell S, Hauser R, Jankovic J, Factor S, Bressman S, Deligtisch A, Marras C, Lyons K, Bhudhikanok G, Roucoux D, Meng C, Abbot R, Langston W. 2009. Occupation and Risk of Parkinsonism. Arch. Neurol. Sep;66(9):1106-13.